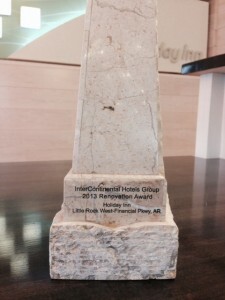 Little Rock, Arkansas – August 23, 2013 – Pinnacle Hotel Group’s Holiday Inn in Little Rock wins an award for best hotel renovation in 2013. 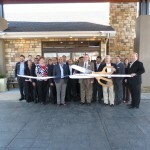 Pinnacle Hotel Group purchased the 2.99-acre property at 10920 Financial Centre Parkway in west Little Rock, in January 2012, and after a 12-month long, mutlimillion dollar renovation, a new Holiday Inn was open for business January 2013 in place of the former Jameson Suites. The number of rooms was reduced from 128 to 119 to allow for a more open concept throughout the hotel, including in the lobby, restaurant and bar area. A new feature is the Hub, a communal space for patrons to dine, socialize and power up electronic devices. Guests will also find a 24-hour market, media lounge and video game station, where kids can play while their parents check in. For more information or to make a reservation, call (501) 225-1075 or visit HolidayInn.com/LittleRockWest.